Do constructed wetlands remove nutrients from nursery runoff?Do constructed wetlands remove nutrients from nursery runoff? Yes. 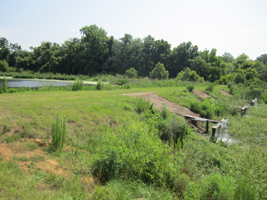 Research with constructed wetlands in various geographic regions shows removal rates of range from 50 to 99% for nitrogen and from 25 to 98% for phosphorus. These results are based on specific experimental conditions and large-scale field trials. Do constructed wetlands remove pesticides?Do constructed wetlands remove pesticides? the physico-chemical characteristics of the compound itself – basically predictors of how the chemical will move in the environment. Will it stay in water? Will it bind with sediments? High removal (84-97% removal efficacy): Organochlorines (e.g. endosulfan and pentachlorophenol), strobilurin/strobin (e.g. azoxystrobin, trifloxystrobin), organophosphates (e.g. chlorpyrifos, dimethoate, glufosinate, and parathion), and pyrethroids (e.g. bifenthrin, cyhalothrin, cypermethrin, esfenvalerate, and permethrin). These groups have low water solubility. Low removal (24 – 50% removal efficacy): triazinone (e.g. metribuzin), aryloxyalkanoic acid groups (e.g. dichlorprop, MCPA, mecoprop), and urea-based pesticides (e.g. diuron, linuron). Water solubility is variable and does not help to predict remediation efficacy. Predicting whether constructed wetlands will effectively remediate the pesticides of concern to you is a challenging process – and highly technical. Please consult with Dr. Sarah White (swhite4@clemson.edu) if you want additional information about this topic. What properties need to be considered when choosing an ultracarb ...What properties need to be considered when choosing an ultracarb filter? Should we choose a coconut shell or coal-based filter? Should it be pre-wetted and acid washed? In the most recent study at the University of Florida, Clean WateR3 researcher and MS student George Grant found there was no significant difference in in paclobutrazol removal between 8x30 mesh coconut or 8x30 mesh coal-based granular activated carbons. This study occurred over a short period of time with a slower flow rate than in a commercial-scale system. It is possible that activated carbon types vary in their shelf-life, but we do not know at this point. The acid and pre-wetted treatments both reduce the percent ash content and make for a 'cleaner' carbon. The ash content on activated carbon is basically fine dust that will wash away when you first start running the system. The ash will turn water black, and an initial back flow is recommended when new carbon has been installed until this ash is washed out. It’s unknown if there are additional costs associated with these treatments, but in theory, they produce a high quality activated carbon that is easier to handle or install. What are the options for removing nutrients from my irrigation water?What are the options for removing nutrients from my irrigation water? You can find an overview at the University of Guelph website. What are slow sand filters?What are slow sand filters? Slow sand filters (SSF) are a water treatment method that use sand on which microorganisms grow. These microorganisms are capable of degrading biological and chemical pollutants in runoff water, including Phytophthora and tobacco mosaic virus (TMV). The disadvantage of SSFs is that slow flow rate of water through the sand is needed to attain treatment. A rule of thumb is one square foot of sand bed can treat about 0.06 gallons (0.2 liters) per minute. A large sand filter is needed to treat large volumes of water. More information is available in this video. Kati Migliaccio (Ph.D) from the University of Florida discusses water quality law and the implications in agriculture. Sarah White (Clemson University) and Loren Oki (University of California) discuss the use of constructed wetlands and slow sand filtration systems for treating water. When you treat the irrigation water to kill pathogens with ...When you treat the irrigation water to kill pathogens with quaternary ammonium compounds, for example, won't the residual present in the water kill the good microflora in the pots? We are not aware of any research on that question. We do know that oxidizers such as chlorine are rapidly broken down as they contact peat or other organic components in growing media. The organic matter would also deactivate a quaternary ammonium product. However, there is a possibility that a chemical with residual activity may have some impact on soil microbes - we just do not have any data. 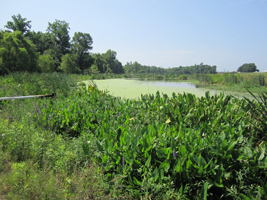 Do constructed wetlands remove pathogens?Do constructed wetlands remove pathogens? We know constructed wetlands remove human pathogens. But there is little definitive information regarding their remediation efficacy for plant pathogens (for example Phytophtora and Pythium). A goal of the Clean WateR3 project is to provide answers to this question. Which water treatment technology should I use to control pathogens?Which water treatment technology should I use to control pathogens? Many technologies are available. An effective system generally requires prefiltration, followed by a sanitizing treatment technology. Options include chemical (e.g., chlorine or ozone), physical (e.g., heat or UV), or biological (e.g., constructed wetlands or slow sand filtration) approaches. Published research on efficacy of different treatment technologies is summarized in our Waterborne Solutions tool. You can compare technologies at the University of Guelph website. How do I know if I am adding enough chlorine into my irrigation ...How do I know if I am adding enough chlorine into my irrigation water to control plant pathogens? Select a meter that will measure free and total chlorine. Decide on the target chlorine dose. To check for research on dose response of chlorine or other sanitizers for a range of pathogens, use our Waterborne Solutions tool under Grower Tools on this website. For example, 2 ppm of free chlorine is a commonly applied dose which can control Pythium and Phytophthora zoospores. You need a reliable meter with reagents to test for both total and free chlorine - check common brands for water quality monitoring such as Hach, Hanna, or Pulse Instruments. 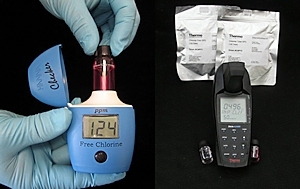 Although free chlorine is the most effective sanitizing form of chlorine, it is also important to measure total chlorine to avoid phytotoxicity (beware of ever applying more than 5 ppm total chlorine or 2 ppm of free chlorine). Invest in a reliable inline dosage measurement and control system. You should have inline sensors to measure pH and oxidation-reduction potential (ORP), and possibly ppm of chlorine. Most phytotoxicity problems result from faulty equipment or calculations - don't fix one problem (pathogens) while creating another (phytotoxicity). Check that the dilutor or injector is working correctly. Calculate how much chemical is being applied for a given volume of water. You can also use our ppm to Recipe tool in backpocketgrower.org, under Tools, to help calculate the dose. An introduction to agricultural water reuse and remediation, including innovative ecological treatment technologies that have the potential to remediate agricultural contaminants from irrigation runoff water, so that water may be reused onsite. Paul Fisher, Ph.D. from the University of Florida discusses the key points on how to design a successful water treatment system that will deliver water at a consistent high quality. Walter Wohanka, Ph.D. from the Geisenheim Research Center (Germany), discusses the pros and cons of water treatment techniques use to prevent disease spread through irrigation. Warren Copes, Ph.D. from USDA discusses alternatives for surface cleaning and sanitation for your greenhouse. Learn how to adjust you the dose of disinfestants by understanding how water properties, materials being sanitized and the treatment process interact with the disinfestants. (USDA does not endorse any of the products mentioned in this presentation). Ken Wagner, Ph.D. from Water Resources Services discusses the problems observed in ponds, the causes of algae problems and the alternative to manage water quality in ponds. Jennifer Parke Ph.D. (Oregon State University) discusses how water management and water treatment fit into a holistic approach for managing nursery plant diseases caused by Phytophthora species. Gary Chastagner Ph.D (Washington State University) discussed the biology of pathogens found in the water. He described how and where pathogens spread in nurseries. Aaron Palmateer (Florida Extension Plant Diagnostic Clinic, Tropical Research and Education Center, University of Florida) discusses the effects of water on plant health, along with information on water molds and bacterial diseases. Robert Wick (University of Massachusetts Amherst) describes issues involved with waterborne pathogens in your production system, their biology, and recommendations for their management. Is duckweed bad for my pond? Do I need to control it?Is duckweed bad for my pond? Do I need to control it? It depends. If duckweed is clogging your pump of filter, then yes - some treatment or pre-filter is needed to keep the floating plants away from your pump intakes. But wholesale treatment of your pond with a herbicide labeled for use over water is not the best solution. As this will not control the duckweed population long term (only changing fertility practices will) - and has potential to introduce herbicide residues to your crops when pond water is used for irrigation later. If control is not based on actual pump related problems - but rather to the appearance of your pond (i.e. it looks bad) - think about these plants as free labor - helping to limit algal growth (shading), cool the water, and cycle nitrogen and phosphorus - keeping your pond healthy. What is clogging my irrigation drippers?What is clogging my irrigation drippers? Biological: The clogging material is usually slimy organic material. Soaking the drippers in a dilute bleach solution should clean up biological material (test the drippers can handle the corrosive material first). If the material is biological, determine where the contamination is occurring (water source, or within the irrigation tanks or pipes). Send in water samples from different locations within the irrigation system to a lab for analysis of total aerobic bacteria counts. Counts higher than 10,000 colony forming units per milliliter indicate a high clogging risk from biofilm. You will probably need to shock the system with a high rate of an oxidizer (such as chlorine, chlorine dioxide, or a peroxyacetic acid product) to clean the lines. Do not let shock solutions contact your crop. To keep the irrigation lines clean, you could then add a low concentration of a water treatment chemical such as chlorine. With any product, follow EPA label instructions and extension recommendations. Chemical: The material may look like powder or be gritty and crystalline. 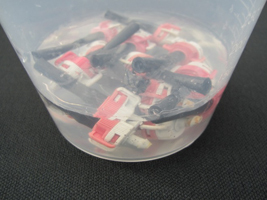 Soak drippers in vinegar (low pH) – if this cleans up the emitters then a chemical problem is likely. Send samples of this soak solution, your irrigation water, and the applied nutrient solution (if you use water-soluble fertilizer) to a testing lab to analyze what specific ions are reacting from your water and/or fertilizer. Knowing the specific ions is needed to take action. For example, you may need to inject acid to reduce precipitation of calcium deposits, or oxidize and filter to remove iron and manganese. A shock with a line cleaner is likely to be needed to unclog lines. Do not let shock solutions contact your crop. Sediment: The material may look and feel gritty. When you soak in warm water, solid particles may drop out. Sediment indicates the need for more filtration, with a finer filter pore size than the emitter size. You may need to blast out lines with high pressure, and use a line cleaner to unclog lines. Do not let shock solutions contact your crop. Why should I care about particle filtration?Why should I care about particle filtration? Filtration of irrigation water involves removing organic and inorganic particulate matter (debris, sediment, soil particles, algae, etc.) from the water prior to treatment for pathogens. Pre-filtration is important for two reasons. Firstly, larger particulate matter has the potential to clog the irrigation system (e.g. emitters). Secondly, the effectiveness of many pathogen treatments (e.g. all chemical treatments using oxidizers, UV) is decreased significantly in the presence of particulate organic matter. You can learn more at the University of Guelph website.